Oh, how long have we waited to Android’s response to the latest generation iPad, and Samsung could just be on to something here. And this is a rather unconventional way of going about it. 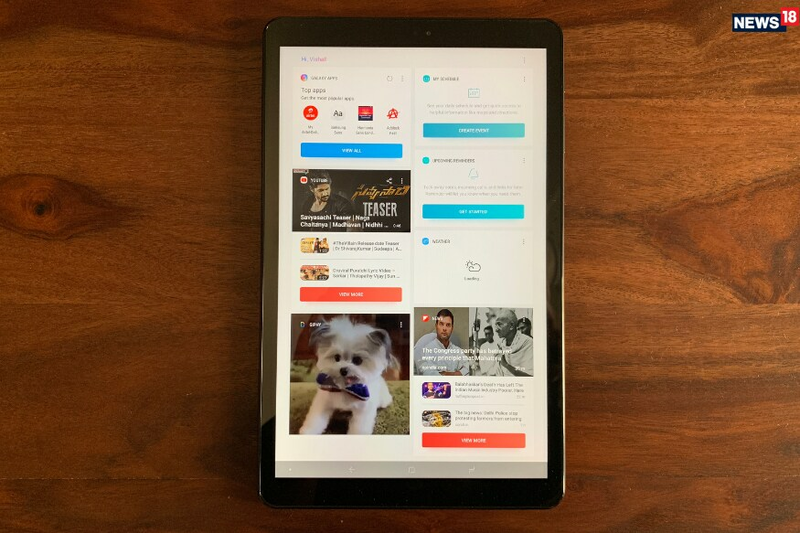 After a significant period of inactivity—and we even had come to terms with the potential possibility that this category may not necessarily have a future—the Android tablet space is finally waking up again. Waking up to the challenge, waking up to the market demand and waking up to remember that significantly higher priced 2-in-1 convertibles aren’t necessarily something that everyone wants. 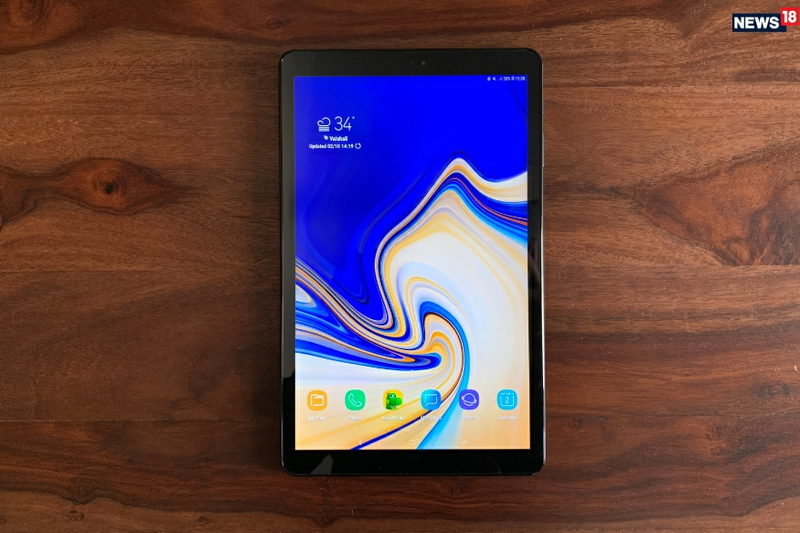 What we have is the 2018 edition of the Samsung Galaxy Tab A 10.5, which is priced as much as the Apple iPad. The Apple iPad (2018) prices start at Rs28,000 (32GB; Wi-Fi) and go up to Rs46,300 (128GB; Wi-Fi + Cellular). In terms of the design, the sheer simplicity of the Samsung Galaxy Tab A 10.5 is what we liked the most. The matte black finish looks classy and should feel right at home at an airport lounge for streaming Netflix, at home for playing Asphalt 9: Legends (free download from the Play Store) and in office for typing emails or simply as a second screen for your PC or laptop. The second advantage of the matte black finish is that it doesn’t catch fingerprints easily, and neither do specks of dust show up as easily as they otherwise might on a shinier or glossy black finish. The Galaxy Tab 10.5 feels great to hold, and the even weight distribution helps. While the iPad is all about the blend of glass and metal, the Tab A 10.5 doesn’t necessarily feel inferior despite not having a metal chassis. The one thing we did notice is that the screen edges are a tad too sensitive, and even though you may just be holding the tablet, it will detect some finger pressure. 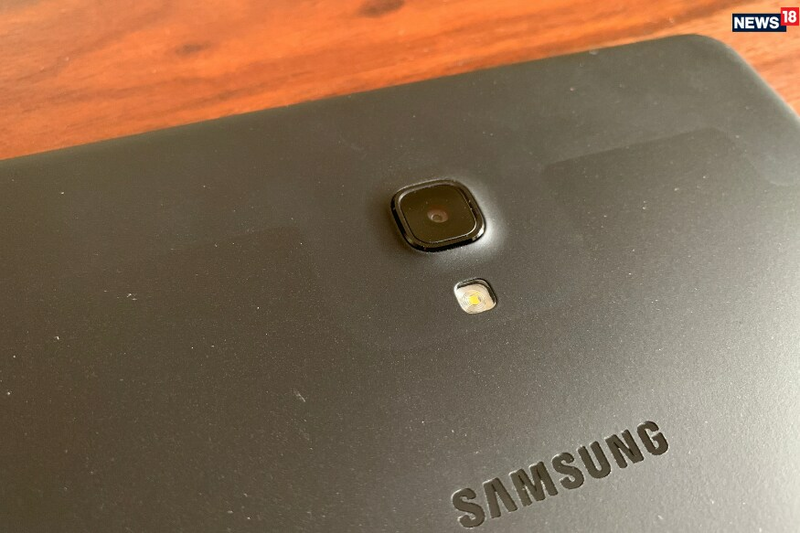 One thing that you’ll immediately notice as you start using the Samsung Galaxy Tab A 10.5 is that this isn’t an AMOLED display, something they use in smartphones and tablets often. This LCD display has a 1,920 x 1200 resolution, which may not look like too much, but isnt entirely unacceptable. This surely is a missed trick to trump the Retina Display on the iPad. But before you worry about how that will impact the viewing experience, we have to say that this screen tries to hold its own, and does fairly well while at that—it distinguishes well between colours and brightness levels are good too. An AMOLED might have been better, but this isn’t really a compromise anyway. It is sharp enough for reading, can be really bright if that is what you need, colours look good and fast-moving visuals are smooth. Under the hood runs a mid-range Qualcomm Snapdragon 450 processor, with 3GB of RAM too. To be honest, these aren’t exactly the specs that we would expect from a tablet that is competing with the iPad, at least on price tag. Nevertheless, we persist. And it was a refreshing surprise in store. In terms of performance, this is all about consistency rather than setting benchmark speeds. Multiple apps run smoothly, and there is no visible stutter at all while running apps. For most users, this should work well enough. However, it is hard to shrug off the observation that the same apps open tend to open a tad slower than they do on an iPad. Then there is Samsung’s own Experience interface wrapped around Android Oreo, which feels a tad sluggish from time to time. Yet at other times, it is perfectly fine, even with multiple apps and games open simultaneously. It is all a tad perplexing, to be honest. If you haven’t used the latest generation iPad, then this isn’t a problem. But if you have, then you will notice these little stutters. It also doesn’t help that the interface that you get to use on the tablet is much the same as the ones on Samsung’s Galaxy phones. It would perhaps not be too much to have asked for some tablet-centric customizations, to better use the extra display real estate—larger widgets perhaps, or maybe a redesigned Bixby screen, for instance. There is no doubt that the battery life is a strong point of the Samsung Galaxy Tab A 10.5. This runs around 16 hours on a single charge, for a mix of web browsing, videos and music, and matches the brilliance of an iPad in that regard. In fact, in our tests, the battery consistently lasted more than the 13 hour or so mark that Samsung touts for the tablets, which is quite good for this 7,300mAh battery. Samsung has touted the audio capabilities of the Galaxy Tab A 10.5, and specifically the Dolby Atmos capable speakers. What you get, for starters, are four speakers—two on the top spine and two on the bottom spine. That means that if you are using the tablet’s own speakers while watching a Netflix or Amazon Prime movie or TV show, the audio you hear is wider, louder and crisper than before. To make the most of the Dolby capabilities, you need really good quality speakers or headphones to even make out the difference, but even as a basic media consumption experience, the Galaxy Tab A 10.5 is already doing a very good job of it. Even as we come to end of this review, we are truly flummoxed by the Samsung Galaxy Tab A 10.5. It is clearly punching above its weight, in terms of the performance and price, if we keep the processor in mind. And the moment you come to terms with this, the tablet does remind you of its limitations with that one little stutter or a bit of sluggishness while switching between apps. We really want to like this tablet, but it is easy to see its foibles too. It is priced in the same range as the latest generation of the Apple iPad, but undoubtedly isn’t as powerful. Who is it really meant for? Thoroughbred Android phones who wouldn’t touch an iPad at the same price? Sure, but how many of that demographic would be that extreme with their allegiances, particularly when it is about spending their own money?